A Facebook group which aims to get the band's 1992 hit Killing In The Name to the top of the festive chart has attracted more than 750,000 members. 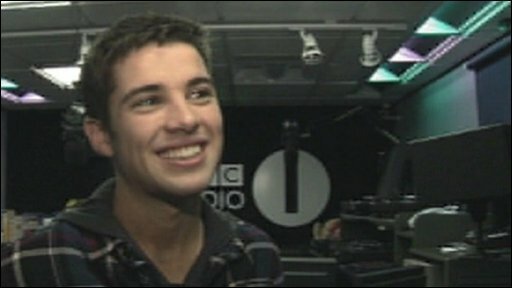 Current figures show the song has sold 175,000 copies, compared to 110,000 for McElderry's single, The Climb. 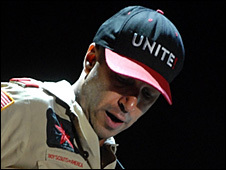 Morello told BBC 6 Music the support for his song was "heart warming". He told the station's breakfast show that the "rebel anthem song will transcend the Christmas holidays". He added: "The one thing about the X Factor show, much like our own American Idol, is if you're a viewer of the show you get to vote for one contestant or the other, but you don't really get to vote against the show itself until now." He added: "It's this machinery that puts forward a particular type of music which represents a particular kind of listener. "There are a lot of people who don't feel represented by it and this Christmas in the UK they're having their say." The guitarist said the single's position as a Christmas number one contender was an "unexpected windfall" and he plans to donate some of the proceeds to a charity which helps children progress their musical careers in the UK. Meanwhile, in an interview with music magazine NME, Simon Cowell - who is behind the X Factor single - said that the ITV1 show had "done everyone a favour" by adding some life to the festive charts. Shows like Britain's Got Talent and The X Factor have actually got people more interested in music again, and are sending more people into record stores. "I think we were getting to a point where [the Christmas chart] was all becoming like The Millennium Prayer, and I just didn't like that song." there's a tradition of quite horrible songs. "I think I've done everyone a favour. "Shows like Britain's Got Talent and The X Factor have actually got people more interested in music again, and are sending more people into record stores. We haven't seen this kind of uplift in years." McElderry's single has been available to download since Monday, but physical copies go on sale on Wednesday. Record industry trade magazine Music Week said the release of the CD single was likely to give the X Factor winner "a massive boost". "While the singles market is now overwhelmingly made up of download sales, X Factor Christmas singles traditionally sell strongly on CD," it added. In recent years, winners of The X Factor have eased their way to the top of the Christmas chart. Last year's winner, Alexandra Burke, scored the biggest-selling single of 2008 with her cover version of Leonard Cohen's Hallelujah.